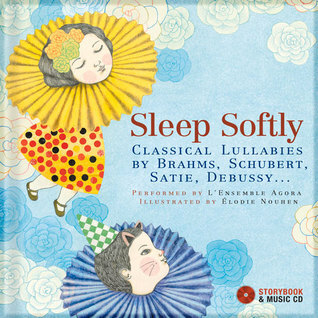 Sleep Softly: Classical Lullabies by Brahms, Schubert, Satie, Debussy... - Frugal Mom Eh! The Secret Mountains’ Sleep Softly: Classical Lullabies by Brahms, Schubert, Satie, Debussy… is a beautiful book and music CD set. The book features dreamy illustrations by Elodie Nouhen accompanied by explanatory notes describing the composition and arrangement of each recording. The illustrations are whimsical with muted colours that are very much reminiscent of a dream. Absolutely gorgeous and perfect for bedtime. Keira flipping through the pages of the book as we listen to the CD together. She really enjoys taking in all the details and it seems to have a calming effect on her. The Music CD was recorded in France with the acclaimed quintet Ensemble Agora and contains sixteen classical lullabies orchestrated for a wind quintet and harp performed by the critically acclaimed L’Ensemble Agora. This is such a relaxing collection of classical lullabies perfect for sending a newborn off to sleep but equally as sleep inducing in older children and adults. What is your favourite Classical Lullaby? Not sure why, but we’ve always used Debussy’s Clair de Lune as a lullaby for our girls. It’s one of our favorites. 🙂 This collection looks great- I’ll have to keep it in mind for baby shower gifts. That sounds so cute. I would love to get this for my young nieces & nephews. I grew up on the classics and still love those old lullabies–all of them. They are so soothing and will stay with your little one for life. I loved playing lullabies for my boys when they were babies. It helped to soothe them to sleep. Sounds like a great CD. I bet my little ones would enjoy this music to soothe them to sleep. These are adorable illustrations. Classical lullabies are the best for young ones. I don’t think I have a favorite classical lullaby, but I do think that playing soothing music really does help the kids to fall asleep easier! This sounds like a great set! This sounds like a great CD. I will have to pick up a copy and put it on at night. I love classical music. wow, my daughter would love this. Thanks for sharing! My favorite Lullaby is :Hush, Little Baby, Don’t you cry… I don’t think this is a classical one. I love the CD you mention and I am so happy you told me about it. The child can look at the accompanying book and have some idea of what the words mean. Thank you for giving us this information. This sounds really lovely for newborns and infants.